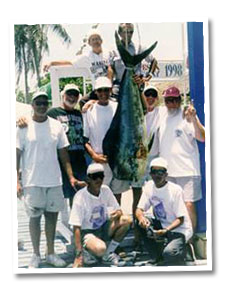 The Sloppy Joe’s Fishing Team followed Ernest Hemingway’s tradition by going to Cuba and bringing back THE BIG ONE – a Cuban National Record Dolphin at 67.5 pounds! 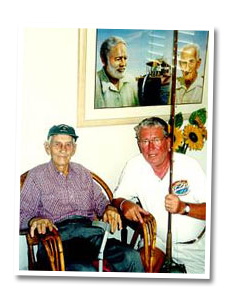 The late Gregorio Fuentes (left), was the captain for Ernest Hemingway for 37 years. Gregorio caught the legendary marlin that inspired Hemingway to write “The Old Man and the Sea,” and years later, Gregorio’s role was portrayed in the film of the same name by actor Spencer Tracy. John Klausing (General Manager of Sloppy Joe’s, at right) is seen with Gregorio during his visit to Cuba in September, 1998. We are proud of our historic connection to Hemingway and all the colorful characters who have enjoyed SLOPPY JOE’S over the decades!